The stock market suffered a losing year in 2018, and even the high-growth companies in the Nasdaq 100 struggled. The index's losses were modest, however, amounting to just 1%. But that was still a big letdown after big gains earlier in the year. A lot of stocks weighed on the Nasdaq 100, but a few had particularly large declines. 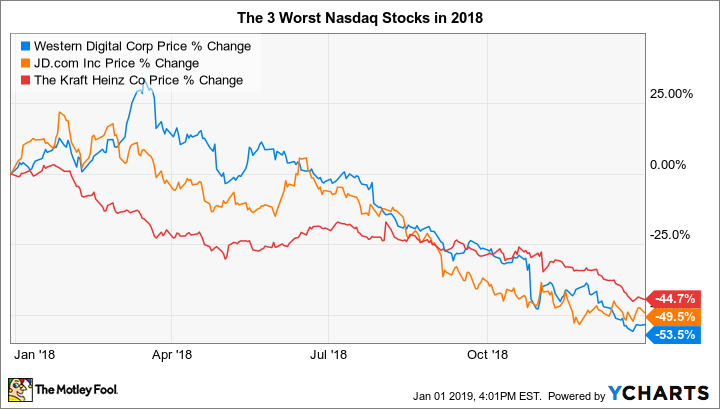 Below, we'll take a look at Western Digital (NASDAQ:WDC), JD.com (NASDAQ:JD), and Kraft Heinz (NASDAQ:KHC) to see why they were the worst stocks in the Nasdaq 100 in 2018. Western Digital ended the year down 54%, and the biggest concern stemmed from the ever-changing role of technological innovation on its business. Western Digital has been a giant in the hard disk-drive business for decades, but the rise of solid-state drives using flash memory has proven to be a big challenge for the company. Even with enterprise customers turning to traditional hard drives for data centers because of their cost-effectiveness, Western Digital ended up acquiring solid-state leader SanDisk, which in turn heightened the company's exposure to the cyclical memory-chip market. Western Digital hopes that appealing to data center customers will help it rebound in 2019, and it's also aiming at capturing a bigger portion of a growing addressable market. Yet short-term negative impacts could hold the stock back in 2019, and the company itself has warned that it could take a while for Western Digital's long-term goals to move within reach. That'll require patience -- something that shareholders haven't shown much of lately. China's JD.com saw its stock lose half its value based on a combination of factors. Not only did the fundamental business start to see slowing growth as the e-commerce giant responded to growing concerns about the strength of the Chinese consumer economy going forward, but JD also had to deal with allegations against founder and CEO Richard Liu that distracted from the company's business performance. Those following the stock hope that JD will be able to move beyond its challenges in 2019. The company will take advantage of its slumping share price by making stock repurchases of up to $1 billion, and between its restructured internal divisions and its efforts to broaden the scope of the services it provides to its customers, JD is optimistic that it can keep up the pace with its competitors in the Chinese internet space. If Liu can successfully rebut allegations and get back to focusing on the business, then JD could see a new surge of confidence. Finally, shares of Kraft Heinz lost about 45% in 2018. The food giant might seem like a stalwart stock that's perfect for a turbulent market, but the company has faced big changes that have left it struggling for a new strategic vision. Health-conscious customers no longer favor the packaged foods that made Kraft Heinz so successful in the past. In response, Kraft Heinz has had to look for ways to position itself toward healthier fare at a time when rival players in the space have already had a head start in pivoting to meet consumer preferences. One such move involved Kraft Heinz's purchase of Ethical Bean earlier this year, which the company hopes will give it a reputation that's more in line with what younger consumers want to see from food businesses right now. Yet investors seem unconvinced that Kraft Heinz's shift will be large enough to move the growth needle for the company, and until those efforts show up in financial numbers, the stock could remain under pressure. If the Nasdaq 100 rebounds from its modest loss, it'll be in part because losing stocks like these three manage to reverse course and move higher. JD has the most obvious avenue toward restoring its reputation, but both Western Digital and Kraft Heinz have to deal with broader industry headwinds that could hamper their comeback efforts in 2019.